Description: A daughter of K A Lady Barbara 1009 and produced the first 2015 bull calf we sold by Musgrave Aviator. Her 2017 embryo progeny by SAV Seedstock, PVF Insight, Mohnen South Dakota and SAV Resource are stunning. A 2018 daughter by SAV Seedstock will be a feature of our 2019 production sale as an elite quality replacement heifer. 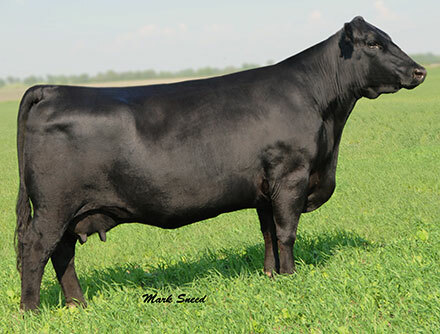 Her 2017 daughters by SAV Resource and Mohnen South Dakota will sell in our 2019 production sale. We are retaining 2 of her 2018 SAV Resource heifers in our herd, and her 2018 PVF Insight son will be retained for breeding at our farm. Description: Maternal, sound and functional with a beautiful udder. This young Lady Barbara female was acquired from Musgrave Angus in Griggsville, IL as heifer calf and has earned her donor cow status the hard way, she earned it. Her flush by Dameron First Impression produced the second top selling heifer and a $4,000 steer in our online sale. Her flush by SAV Resource produced two really stout bulls for our 2018 bull sale, a steer that sold at the Lamoine Valley Sale and a beautiful heifer that will be retained in our herd. Her natural bull calf by SAV Seedstock will be in our 2018 bull sale. Her 2017 SAV Resource daughter will sell in our 2019 production sale with a calf at side. Description: DECEASED. Our original Evergreen Erica. She was acquired from Marvin Kramer of Kramer Angus in Farina, IL from their featured cow line that is noted for low birth, growth and performance. 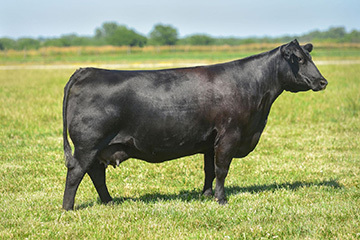 #4402 is now deceased due to a hip injury but was an outstanding producer and we have embryo daughters by EXT (#9905), H S A F Bando 1961, MCATL Reachout, and Connealy Consensus 7229. 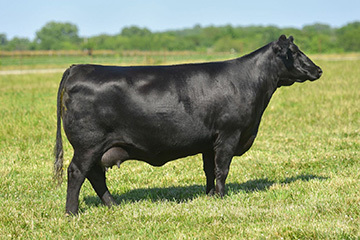 A 2018 granddaughter by SAV Raindance will sell in our 2019 production sale.